WAILUKU » A mental health facility for youths has reopened on Maui and is expanding its outreach to other Hawaii islands. Molokini II at Maui Memorial Medical Center was closed nearly three years ago after a couple of on-call psychiatrists quit. Wesley Lo, chief executive officer of the medical center, said the facility has reorganized with two psychiatrists and an advanced-practice registered nurse on hospital staff. Medical observers note the on-call workload at the facility has been excessive in the past, particularly for psychiatrists with their own practices. "This is an important new beginning, and I'm really happy it opened for our youth," said Colleen O'Shea Wallace, executive director of the nonprofit Mental Health America in Hawaii. Lo said the new program has similarities to one used in Alaska, where an advanced-practice registered nurse may authorize prescription drugs to treat the mentally ill.
Hospital officials noted the importance of having hospital-based psychiatrists who are allowed to focus their efforts and attention on patients in the ward, as well as staff working in the ward. "We're actually pretty excited about this," Lo said. "You don't know how hard it is to find a passionate staff that really wants to change a community. ... Finally, we've got a great team who can really make some dramatic changes in the community." Lo said that while patients have come from Maui and the Big Island since the reopening, he expects youths from all islands will use the facility eventually. While the hospital has not actively sought young patients from off-island in the past, the new setup allows it to treat a greater number, Maui Memorial said. The ward, which averaged about four patients daily, can now handle up to seven youths ages 13 to 17, hospital officials said. Patients enter the program through private admission. 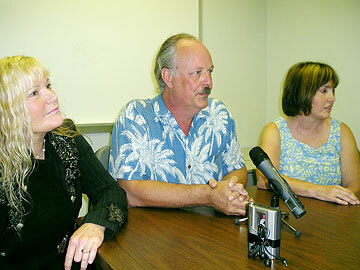 Lo said Maui Memorial has had discussions with the Queen's Medical Center about handling its patient overload. Dr. Harold McGuffey, a physician and also medical director of the hospital's Behavioral Health Services, said having Maui youths treated on the Valley Isle offers a chance for more consistent outpatient care once they are released from the ward. They can receive hospital care for problems including suicide and depression without being transported to a facility on Oahu. That allows them to stay close to family and reduces the chances of repeat episodes, McGuffey said. "You have much better treatment, much better continuity, if you do treat the child in a home environment, where you can have a lot of interaction with the family and with the child," he said. The facility, closed June 1, 2004, reopened last month. Other members of the team include Dr. LiLi Kelly, a child and adolescent psychiatrist and a former chief resident at Queen's, and Suzanna Dee, an advanced-practice registered nurse who worked as a psychiatric nurse practitioner in Bethel, Alaska, for five years. Lo estimated that the hospital could nearly break even or lose up to $175,000 annually by reopening the facility. But he sees it as a necessary service to the community. Officials at Molokini II can be reached through the hospital emergency room or through the state toll-free line, (800) 753-6879.